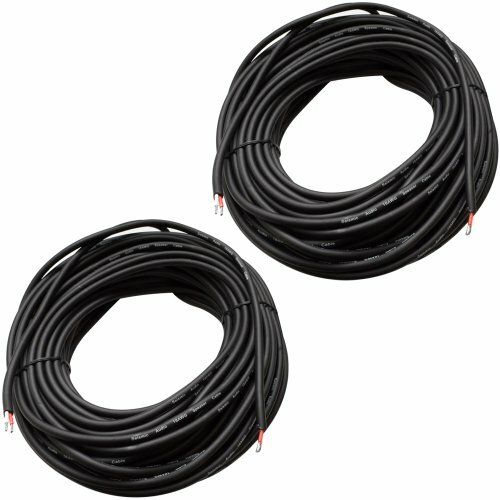 Pair of Raw Wire Pro Audio Speaker Cables - 75 Foot Model #: RW75 (Pair) Raw Wire on each end 16 Gauge Wire PVC Wrapped Shielded Color: Black Length: 75 Feet Home Speaker Use Build Your Own Cables Perfect for Speakers, etc. that have the red and black tabs Condition: NEW One Year WarrantyWhether you have a permanent installation or mobile, Seismic Audio's Raw Speaker Cables are rugged enough to handle whatever you throw at them - road ready and built to last. The quality of the cables you use to connect your sound equipment is critical if you are looking for an accurate music and sound reproduction. If you are looking to build your own PA speaker cables or if you want heavy duty cabling for home audio, these Seismic Audio raw cables will fit the bill. These are ideal cables for speakers, receivers, or amps that have the red and black raw wire tabs. If you need one end to remain a raw wire and need to add a 1/4" or Speakon connector to the other end, you can solder the connector you need on the opposite end. If you do not feel like soldering, check out our other products, we have 1/4" to Raw and Speakon to Raw cables as well. Ideal for building your own cables or using for Home Audio that has the Black and Red Tabs.